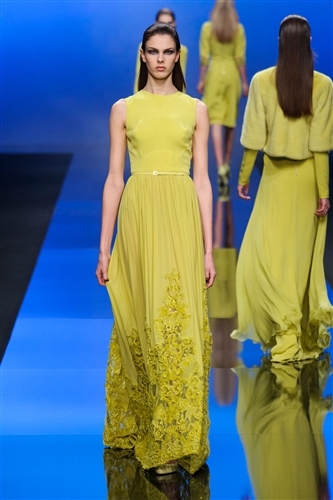 Eli Saab is a master of dressing women, especially when it comes too glamorous, red carpet dressing. Eli creates entirely irresistible dresses and this season was no different with floor length dresses in navy and black, which glistened and sparkled down the catwalk. One of the reasons Eli’s designs stand out amongst the many evening wear options is how precisely cut they are, and how perfectly tailored they are for a womens shape. The respected designer did however progress his aesthetic with this collection, by increasing the amount of day appropriate looks. Dotted throughout the show were day dresses with striking zip detailing, full skirts, jumpers and some outerwear. While Eli has never been exclusively a evening wear designer, this collection surprised and delighted with the amount of day wear looks.